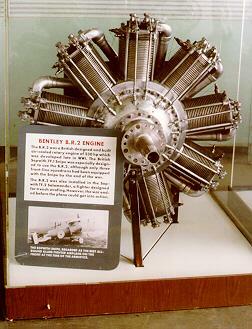 The B.R.2 was a British designed and built air-cooled rotary engine of 230 horsepower which was developed late in WWI. The British Sopwith 7F.1 Snipe was especially designed to use the B.R.2, although only three front-line squadrons had been equipped with the Snipe by the end of the war. The B.R.2 was also installed in the Sopwith TF.2 Salamander, a fighter designed for trench strafing. However, the war ended before the plane could get into action.